Leopard geckos are lovely gentle animals with real personality that make great pets. They are easy to care for and readily available in many different colours and patterns, but being reptiles they do have specialist requirements. A glass terrarium or a wooden vivarium can be used to great effect. Wooden vivariums cost a little less to set up and run than a glass terrarium. However, glass terrariums can make a more attractive display and can be used for a bio-active (live plants and live clean up bugs) set up. 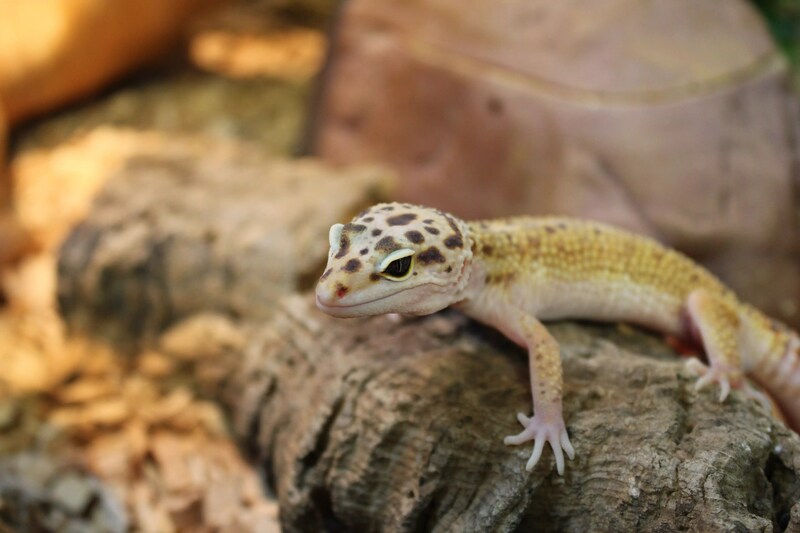 A single Leopard gecko can be kept in a 60cm (24”) terrarium or vivarium, but as they are fairly active they would appreciate a larger vivarium. Temperature is very important in reptile care. Reptiles cannot produce their own body heat and need to be kept within a suitable temperature range to enable the body to function correctly. Leopard geckos require a thermal gradient of 25˚C to 30˚C during the day; this can be achieved by using a heat mat and a basking light on thermostats mounted at one side of the vivarium to create a warmer side. At night the temperature should drop to around 20˚C to 25˚C. A simple 12 hour light cycle is ideal for Leopard geckos. UV lighting is essential and can be provided using a UV strip light or compact lamp. Read our blog on UV Lighting for nocturnal snakes and amphibians. It is important to provide your gecko with fresh water every day, in a shallow bowl to help the geckos and crickets climb out of the water. The gecko will require a few hides in the vivarium so that it can feel secure. By having 3 or more (preferably more) in different areas of the vivarium the gecko will be able to chose the one that is at the best temperature. A humid hide is also recommended. These are hollow hides with damp substrate inside; geckos will often use these when they are shedding their skin. Leopard geckos are insectivorous. They eat a variety of insects which can include crickets, mealworms, wax worms and locusts. It is important to feed your gecko appropriate sized foods, roughly half the width of their head. Crickets and locusts are to be used as the main foods as they are lower in fat than wax worms and easier to digest than mealworms. 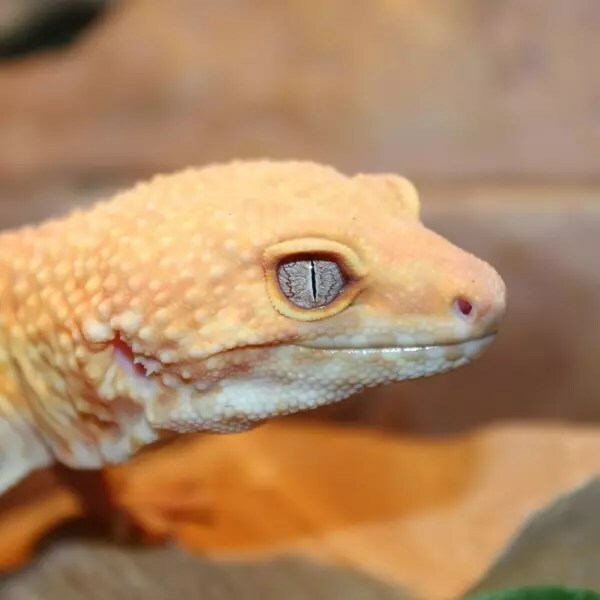 Vitamin powders are very important to prevent problems such as Metabolic Bone Disease, which is usually caused by calcium deficiency and can be fatal, especially in young geckos that are growing quickly. It is easy to prevent with the regular use of vitamin powders when UV light is provided and the correct temperature is used. Leopard geckos are fairly clean animals and will defecate in one area, which should be cleaned daily. Clean and disinfect the water bowl on a weekly basis. Depending on cage conditions, remove all substrate & cage furniture and completely disinfect using a reptile safe disinfectant monthly. Rinse the enclosure thoroughly and allow to dry before replacing cage furniture and your gecko. Geckos shed their skin as they grow. They generally shed at night, and eat the skin. If the gecko has trouble removing the skin it is usually because they don’t have access to a humid hide, or it may be an early sign of a serious vitamin deficiency. Try putting a humid hide in the vivarium, and if this doesn’t solve the problem call us or a reptile vet for assistance. Leopard geckos are great to keep, very interesting, fun to own and easy to care for. They are great for all levels of reptile keeper from the beginner to the experienced.